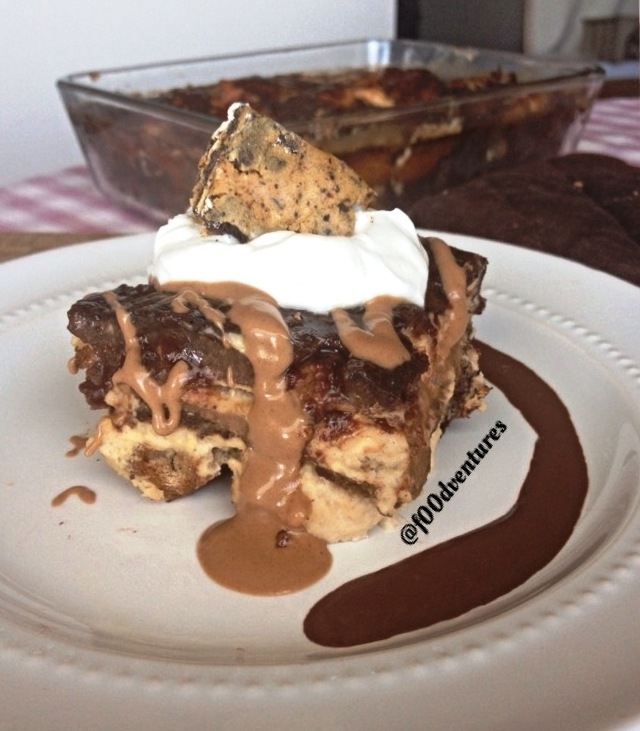 Be prepared to have your taste buds blown away with this delicious (protein) french toast bake. chocolate infused french toast layered with a quest peanut butter protein cream and chocolate chips. this delicious french toast will having you coming back for more. and more. and more. 1) Spray a small oven safe container (I used a glass 8x6x2") and line with half of the cubed bread. Set aside. 2) In a small bowl beat the eggs and mix in the vanilla extract, baking cocoa, and sweetener of choice. Mix well until baking cocoa is fully incorporated. It may take a few minutes so be patient. Set aside. 3) In a medium sized bowl mix the cultured coconut milk with the peanut butter protein. Spoon half of the peanut butter and cultured coconut milk mixture over the bread then layer with chocolate chips (if using). Pour half of the chocolate egg mixture on top. Repeat with the bread, peanut butter and cultured coconut milk mixture, chocolate chips, and chocolate egg mixture. Make sure the bread is evenly coated as much as possible then cover with lid and let sit overnight. 4) In the morning, preheat oven to 350 degrees f. bake covered for 30 minutes, remove cover and bake another 30 minutes. watch closely to make sure it doesn't overbake. let cool, top with desired toppings, and enjoy!